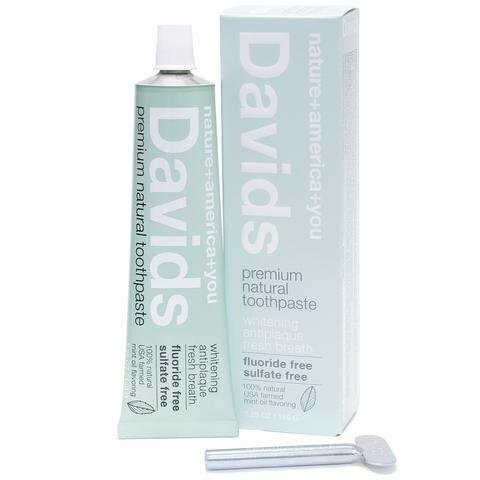 Davids premium natural toothpaste is made using the highest quality natural ingredients to safely & effectively whiten teeth, fight plaque and freshen breath. Ingredients: Calcium Carbonate, Purified Water, Sorbitol, Sodium Bicarbonate, Vegetable Glycerin, Hydrated Silica, Zylitol (birch derived), Sodium Cocyl Glutamae, Carrageean, Mint Oil, Stevia (leaf extract). No Artificial Flavors, Sweetners, Colors or Preservatives.